Ownership / Access: City of Nantes. Notes: The Château de la Gaudinière is a castle located in Nantes, in the Breil - Barberie district, France.The castle of La Gaudinière was built in the eighteenth century. Before the Revolution, it was the property of the Chaurand family, a rich family of Nantes shipowners in connection with the Beauharnais and the Tascher de la Pagerie. It became the property of the families of Aux, then of Perrien in 1814. 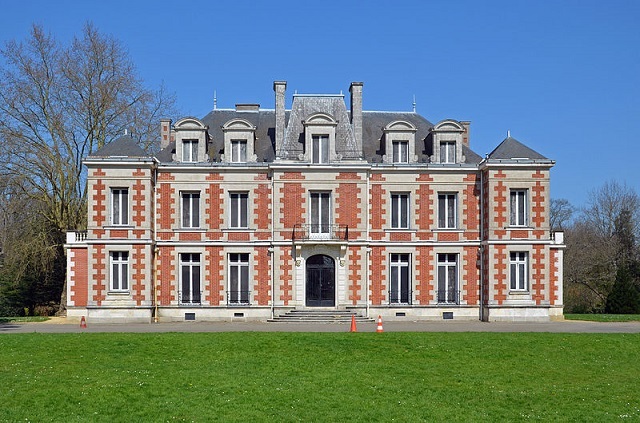 Under the Restoration, it is acquired by the Goüin family, friends and former neighbors of the Balzac in Tours. The property is composed of a dwelling house with a courtyard, a chapel, an English garden with an orangery, an orchard with a pond and a wood. It offers a pleasant setting for a gentleman farmer who is interested in the new fashion of pleasure gardens and for plants from America and recently introduced like magnolia and bald cypress. In 1857, the castle and its park of 8 hectares passes to the banker Jules Brousset, relative of Goüin. The park then underwent significant extensions and embellishments with the help of the landscape architect Provost. He built the castle between 1864 and 1873 on the site of the previous residence (the castle has however undergone major changes since then). The red bricks sliced ​​with the white of the tufa usually used for the follies of Nantes and the great bourgeois dwellings on the banks of the Erdre. It was also in 1864 that a giant sequoia from North America was planted near the castle in the upper part of the park, which reached an area of ​​17 hectares in 1881. In 1918, another family of bankers, the Belot, became the owner of the estate. She then began the restoration of the park with the help of the renowned Lizé brothers, landscape horticulturists. It resold the park to the city of Nantes in 1936 (part of which allows the creation of the cemetery of the bridge of Cens), before selling the castle and its surroundings to the Foundation of Auteuil in 1942. In 1948, the Regional Health Insurance Fund (CRAM) acquired it in order to create a functional rehabilitation center. 7,500 m2 of additional premises are built over the years. But located in wooded area, the extension of the center is impossible, thus making its transfer inevitable. Finally, the city of Nantes bought the castle and its surroundings in 1992 and had the buildings built by the CRAM built during the last decades so that the building could be restored to its original appearance. Nevertheless, at the beginning of the 21st century it was still unoccupied.